In our opinion, some of the most gorgeous guitar pop in the world over the past several years has been coming out of Finland. The latest is the superb Gentle Slopes by Tampere, Finland's four-piece Mumrunner. The five song EP, the band's sophomore EP, displays a muscular brand of dreampop and shoegaze with massive post punk rhythms and and upbeat tempos. And then there are the guitars -- they jangle, chime, ring, grind and chug, with twin emphasis on urgency and melody. The vocals are just high enough in the mix to be interesting, but never intrude on the instrumental fireworks. Rare is the band that can create dense and intricate soundscapes while still delivering pop music satisfaction. 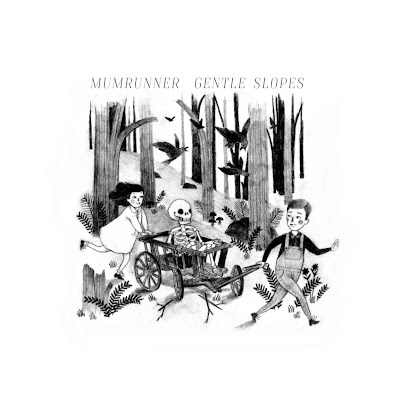 Mumrunner is such a rare band, and Gentle Slopes is a deeply satisfying example of their art. Gentle Slopes will be released on Friday, September 9, in digital by Helsinki label Soliti. Vinyl will be available via German label Wolves & Vibrancy Records.